Simultaneous high-temperature thermal analyser with the possibility to measure following characteristics: thermogravimetric analysis (TG), differential scanning calorimetry (DSC) and differential thermal analysis (DTA) in range to 1600°C. Generally employed for study of physical and thermic processes in materials with thermal effect (crystallization, melting, evaporation, dissociation, chemical reactions between components etc. MCR rheometer covers all rheological applications from routine quality control to high-end research and development applications. Special measuring cells: non-elutriating sample cells which are available for measurement of very fine powders with volume 10 and 5 cm3. 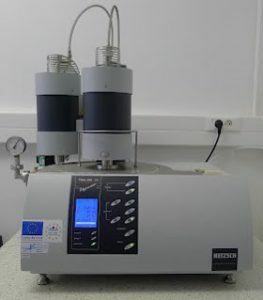 Device for simultaneous particle size measurements and zeta potential measurements in suspensions. Modular electrochemical research system for measurements of electrochemical properties of materials and compounds. ModuLab system allows electrochemical measurements (potentiostatic/galvanostatic) in melted salts, glassforming melts, and in both aqueous and non-aqueous compound solutions (solutions with high resistance). Frequency analyser allows measurements of impedance properties of materials (glass, ceramic and glass-ceramic) and compounds in broad range of impedancy, frequency and temperatures.